Last week we paid a visit to coastal Sussex to a min-flood-plain site that is home to a number of Dactylorhiza species that grow in profusion. 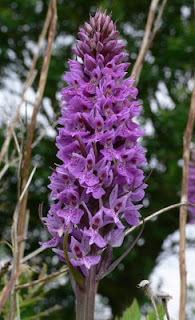 For many reasons, I like the Dactylorhiza genus,the various species are usually stately and attractive plants and in Europe you are never far from one species or another, they can be found from the Mediterranean to the Arctic circle and the genus is represented in just about every habitat type. 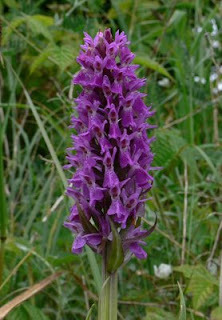 I do however often have problems with identification of many of the species mostly centred around the facts that firstly, Dactylorhiza is an essentially purple-flowered genus and superficially (the level of most of my plant identification), many of the flowers are similar and secondly, in many cases hybridization occurs between species often producing fertile offspring intermediate between the various parents. 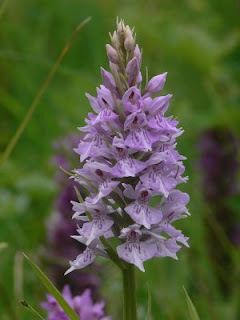 At this site, there are three or four species depending on your choice of nomenclature, Common Spotted Orchid D.fuchsii, Southern Marsh Orchid D.praetermissa, and two Early Marsh Orchids D.incarnata (D.incarnata incarnata) and D.pulchella (D.incarnata pulchella). 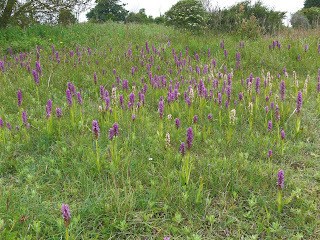 As far as I am concerned, this number of Dactylorhiza species growing in the same place and such a small area (the entire site is no more than 400m x 100m) is quite unusual so perhaps given the circumstances it is not surprising that all sorts of strange things have happened (a bit like humans). D.incarnata presents no problem of identification because the flowers are not purple but a wonderful flesh pink. The top picture shows a few flowers with typical markings and although the outer lip is not bent back something that is supposed to be fairly characteristic! Having nailed this species, the direct comparison of flowers enables the identification of the other Early Marsh with some certainty, D.pulchella and splendid plants they were too up to 60cm high with intensely coloured flowers and dense spikes, real crackers (above right)! Interestingly, at least I thought so, the two Early Marsh species tended to grow in separate patches as though their requirements were slightly different. Moving on there were scattered plants of easily identifiable Common Spotteds D.fuchsii, typical colouring and the clearly indented lobe to the lip. But then there were many more plants that at a distance screamed Common Spot but when you looked closely were similar to the one on the left with an atypical lip shape but still with spotted leaves. 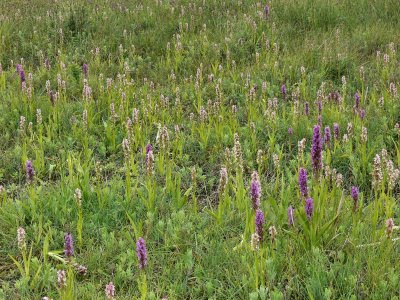 In addition, there were occasional plants that appeared to be pretty standard Southern Marsh Orchid (D.pratermissa) such as the one on the right and non-spotted leaves but then there were those with exactly the same flowers but spotted leaves and so it went on. After a while it became clear we were in the middle of a hybrid swarm, not as dangerous as a bee swarm unless you keep on insisting on identifying the individual plants. After a while you begin to doubt whether any of your identifications are correct, so take everything here with a pinch of salt! Apparently this population has been the subject of a number of academic studies that I have not read (!) and it illustrates the problem of trying to identify individual species within genera that contain species are clearly not yet stabilized or whatever the correct term is. In this case the simplest thing to do is sit back and enjoy the plants and the spectacle. A sheer joy!! 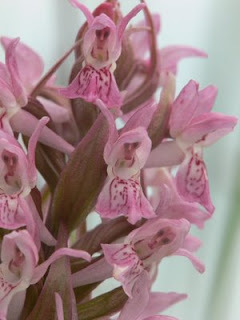 Your flower shots are excellent,I'm very interested in your orchid shots as I also photograph the wild orchids I find on my travels,I also have orchids growing in my backgarden.